This is my friend Nate. Nate was a huge help with my wedding this summer. He helped me pick out shoes, listened to me stress out about all the planning, hooked me up with a great jazz trio for the reception, and played cello at the ceremony. He’s also the bass player for The Decemberists. See that sweater he’s wearing? That sweater is a small token of my appreciation for the aforementioned help, and a physical representation of how I feel about our friendship. That sweater was also just barely snatched from the jaws of a pattern that was doomed to fail. 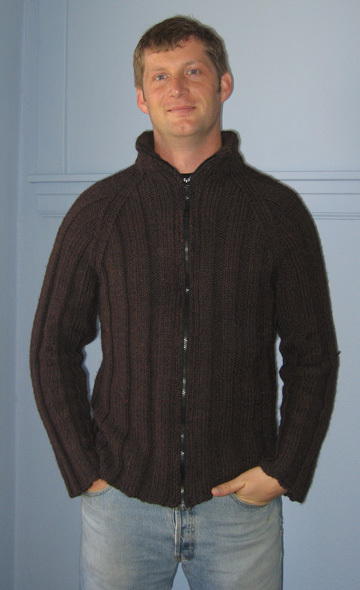 I would say that this pattern is the Men’s Zipped Raglan from Last-Minute Knitted Gifts, but the sweater that Nate is wearing is no longer that pattern. Maybe one of the sizes is written correctly, but the not the one I knitted (42″). If I’d followed the pattern to the letter, the knit/purl “stripes” on the sleeves and would not have matched up with the ones on the body, and the collar would have looked right around Nate’s neck only if he happened to be an elephant. I’m not sorry I came across this pattern, though. The modifications I made taught me pretty much everything I need to know about designing a sweater pattern, which I’m about to start knitting (once I’m done finishing this baby dress I’m working on, plus sewing the zipper on my friend Suzanne’s sweater, and knitting a Danica scarf for my mother’s birthday). And Last-Minute Knitted Gifts is hardly a wash, as it also features that bunny. Most of all, that sweater is my first instance of a Cursed Project and a Transcendent Project converging in one pattern. You have to admit, Nate looks totally awesome in that sweater. The sweater looks great! Love the color too. It looks like a perfect fit. The Decemberists, you don’t say. One of my friends raves over them, he’s up in Washington though where it’s easy to find them playing on the circuit. Nice sweater needless to say. By the BY, I too love Urban-Ore.
Love love love the sweater!!! I want to knit one for my boyfriend now!!! It’s gorgeous. Sorry you had so much trouble with it, but it turned out awesome in the end!!! Yes! He looks awesome in that sweater, and the yarn and the pattern fit one another really well. You are so thoughtful – I don’t think I managed anything for the friends who helped out for our wedding, though I’ve returned the favor in several cases. Good call, you, and bravo on the perseverance factor. Look great! And the sweater’s nice too. ahh thanks for the tip, I haven’t read the pattern completely yet since I’m not ready to start on it but I’ll keep this in mind. It came out great and fits him perfectly, what yarn did you end up using? I used Encore Chunky, color number 1444 (chocolate heather). I was just curious about the name of your scarf. In my experience my name is pretty rare so it was surprising to see it on Knitty! What made you choose it? Nice jacket! I’m just making one for myself – hopefully without knit and purl trouble. I love this sweater. The color and the collar just make it…perfect. Whoa, it looks gorgeous! I just learned what a Cursed project is, but I wonder what a Transcendent Project is … Hey, I just saw The Decemberists play last month in Amsterdam! They rawked my socks right off.